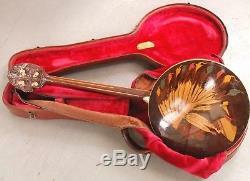 Circa 90-year-old plectrum banjo & case in great condition, with loads of decorative details! 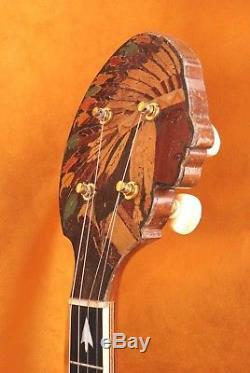 Indian-head marquetry in multi-colored woods covers the resonator's back and the peg head's front side. Orange-and-brown inlaid wood, punctuated with mother-of-pearl arrowheads and crosses , surrounds the walnut resonator. Neck inlays on the front are a light-toned wood, ebony? , and more mother-of-pearl insets in assorted fancy shapes. 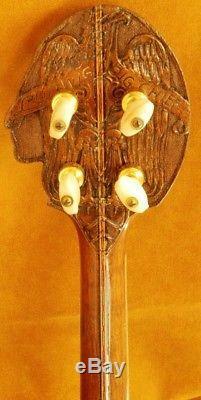 The peg head's back is hand-engraved with an eagle , plus "LUDWIG" and BIG CHIEF. Also on this side is an inlaid strip of inlaid wood running down the neck's mid-line, and near the heel on either side of the neck. Is a hand-carved peace pipe. 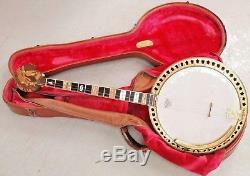 Don't miss this opportunity to own a true crown jewel of pre-Depression American musical instruments. Tuning keys (pegs) are thick, smooth pieces of mother-of-pearl, shaped to fit one's fingers comfortably. Rass rim (pot) & tailpiece look to be. As do its brackets (J hooks)--all very brightly shiny. The arm rest also looks like gold-plated brass and shows some wear. Crazing of both Indian heads is consistent with its original lacquer/shellac finish, attesting to the banjo's age & character. Drum head and strings look new; all else appears original. Red-velvet-lined hard-shell brown leather case is in very good condition, although its rubbed edges will leave a slight powdery deposit in the hand unless brushed off. Same-color-velvet banjo cover closes with a fully functional zipper going the length of the case. Underneath the case's neck portion is a velvet-lined lidded box. Leather trim on the case's bottom end has a few cracks, but its handle, brass latch & hinges, and brass "bumper" knobs on sides, ends, & bottom are tight and intact. The velvet, too, is intact, and inside the case's lid is a banjo-trademarked emblem: "Ludwig BANJOS", "THE ULTIMATE IN BANJOS, " CHICAGO, U. 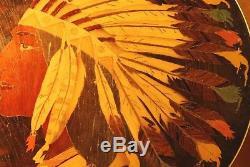 Look soon for my separate listing of an INDIAN-HEAD LUDWIG PLAQUE, same size & detailed marquetry as on the resonator, with a illustrated "map" taped on the back that labels each type of wood used--even more rare than the Big Chief banjo! 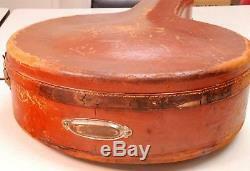 The item "Big Chief Banjo & original leather case by Ludwig, ULTRA-RARE! 1930" is in sale since Saturday, December 15, 2018. 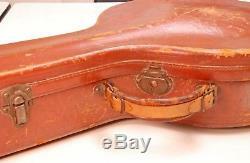 This item is in the category "Musical Instruments & Gear\Vintage Musical Instruments\Vintage String\Folk & World\Banjos". 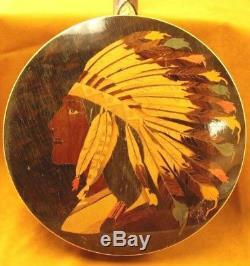 The seller is "imaginaryindians" and is located in Indianapolis, Indiana. This item can be shipped to United States.